Since 1976 Cherryland Auctions has offered antique postcards for sale to both collectors and dealers. We have had 334 regular postcard auctions with one closing at least every 6 weeks for the past 40 years. 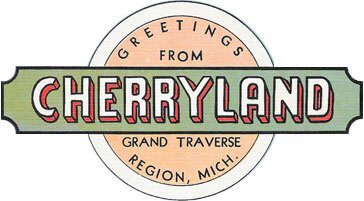 Alec Millard, the owner, is joined by his wife Carie Millard in continuing the family postcard tradition in Northern Michigan's cherry growing "cherryland" region. Alec & Carie still continue the company's tradition of integrity, professionalism, and love of postcards. Ronald Millard, the company founder, has over 37 years of experience as a trusted antique postcard dealer. Ron is mostly retired these days, though he still helps with the closing of auctions and travels to the occasional postcard show. Postcard Approvals for Collectors & Dealers (Contact Us). Postcard Auction Bidder in Indiana - "Thank you once again for sending such great cards. You are Tops when it comes to grading a postcard." Postcard Auction Bidder in New York - "Just a BRAVO on your latest Auction Format & your postcard store. Thank you for efforts to provide maximum info at the easiest & clearest methods." Postcard Auction Bidder in Connecticut - "Thanks in advance for your professional service. I used to work at Sotheby's (NY) so I really appreciate all that you do!" Postcard Auction Bidder in California - "Many thanks for all you do to brighten the life of we postcard collectors." Postcard Auction Bidder in California - "Just received my cards, perfect as described. Loving being back in the Millard family! Thank you for making collecting so enjoyable." Postcard Auction Consigner in Iowa - "Received the check from the postcard auction. Thank you so much! You have a very professional approach with your auctions. I appreciate your service very much." Postcard Auction Consigner in California - "What a nice surprise to get your check today. I am quite pleased with the results. Thanks for your help. If I have anything else, I will definitely send it to you!" Postcard Auction Bidder & Consigner in Florida - "I'm very happy with the postcards I won, especially the two zodiac sets. As the postcard collecting bug seems to have bitten me again, I'm looking forward to "wheeling and dealing" with Cherryland Auctions. We do go back many years - in fact, to your first auction." "Alec has developed a beautiful website, easy to navigate, and I really favor the new auction viewing format. Checked it out today. Enjoyed our recent phone chat. You will always have my eternal thanks and appreciation for your assistance in selling off our paper inventory."